In the midst of a heat wave in the South of France, Henri Matisse visited a long-time favorite swimming pool to relax. Unable to properly cool off and finding the crowds unbearable, Matisse demanded to his assistant they go home immediately where he would begin work on his own swimming pool, his own way. What resulted is The Swimming Pool (1952), one of Matisse’s most beloved works on paper. To create the piece, Matisse had his team of assistants cover his dining room walls in burlap and secure a band of plain white paper around the perimeter. Using only blue paper, Matisse then cut out a series of shapes to mimic the look and energy of divers in the water. The effect is a magical, interactive experience between the work and the viewer. With the life size divers dipping in and out of the water on three sides of you, you feel immersed in the water yourself. It’s fun, playful and energetic. After Matisse’s death in 1955, The Swimming Pool was dismantled and sent to Paris. The Museum of Modern Art (MoMA) purchased the important piece in 1975 when it became a favorite of the museum’s visitors. Unfortunately, burlap is a preservationist’s nightmare. It is an incredibly volatile medium and after so many years, the burlap darkened and the acidity began to affect the integrity of the paper, making it unsuitable for display. Finally, in 2008, the MoMA undertook a large-scale research and conservation project to determine the best way to care for and preserve the beloved masterpiece. And out of necessity comes invention. While the restoration team was busy restoring the beloved Swimming Pool, the curatorial team began organizing what has turned out to be the most comprehensive presentation of this body of work ever mounted. There are over 100 Cut Outs represented in the MoMA’s exhibition from an extensive grouping of both public and private collections. The cut outs were a spectacularly innovative discovery for multiple reasons for Matisse; the artist had been suffering a bout of cancer and was wheelchair bound with limited mobility. He was finding it more and more challenging to paint at an easel or to get outside for inspiration. The Cut Outs allowed him creative release in the simplest terms. 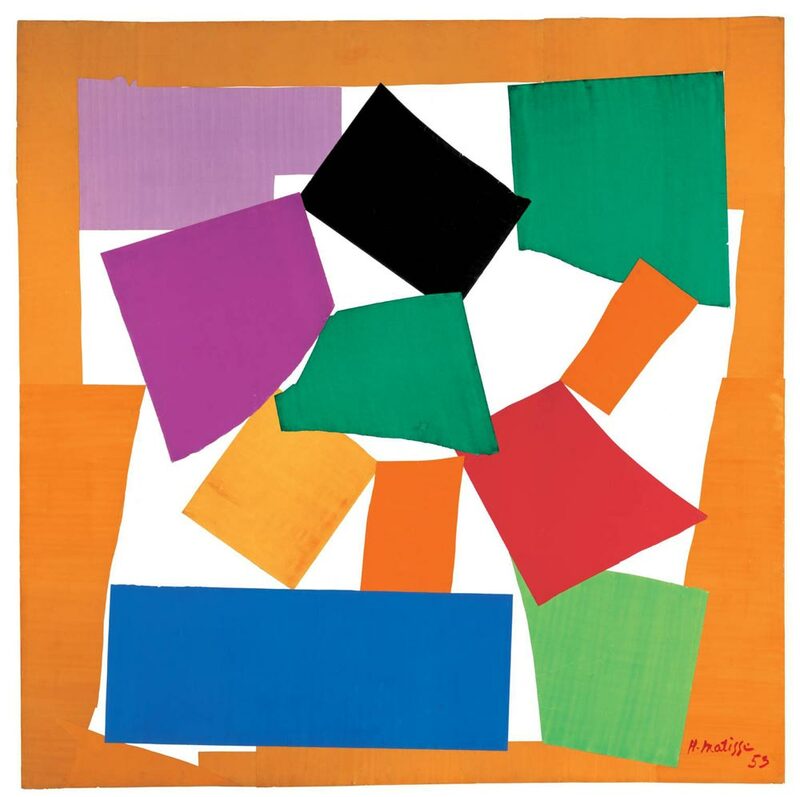 Plus, his assistants were able to easily collect the cut out shapes from Matisse’s side and arrange them on a wall at the artist’s direction until he was satisfied. Matisse was never fully confident of the Cut Outs artistic merits – he began the project as a personally fulfilling endeavor, not to create financially or critically successful art. Last weekend was the final weekend of the Cut Outs exhibition at the MoMA, and to accommodate the show’s popularity, the museum kept its doors open 24/7 with tickets available around the clock. I secured a midnight ticket on Sunday, February 8th and joined the (surprisingly large) crowds through the darkened museum in the middle of the night to the Matisse Cut Out galleries – a celebration of life, color and form. The scale was grand and the colors vibrant. It was overwhelming in the best way; everywhere you turned you were met with vibrant color and intricate shapes. The abstracted shapes in primary colors began to take on life; there was a frenetic feeling of movement in the air (and that wasn’t just because of all the bodies in the space!). In not-specifically-Matisse news but news all the same: BJ Novak had midnight tickets with actress Zoe Kazan and walked around the show in a Boston Red Socks cap pulled low. For my Office-loving self, it was quite an exciting addition to my evening. 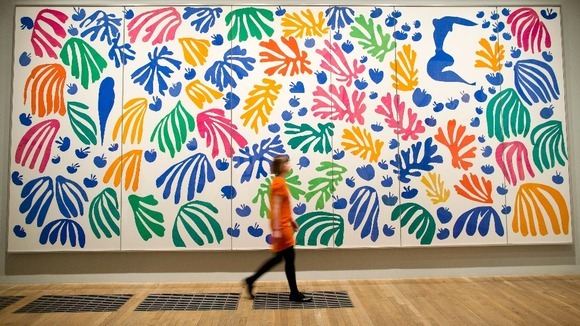 The exhibition was a ravishing, thoughtful celebration of Matisse’s Cut Outs. The collective love of these Cut Outs – from Matisse to the museum curators to the visitors – shone through at every turn.